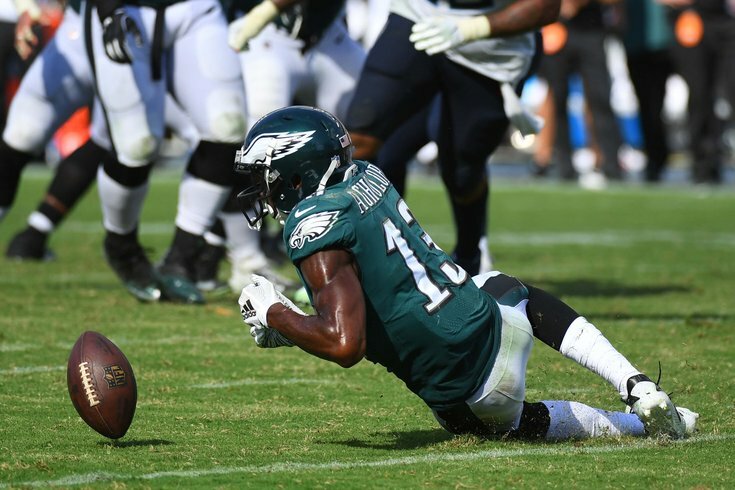 Philadelphia Eagles wide receiver Nelson Agholor can't pull in a pass on third down in overtime against the Tennessee Titans. Whenever the Eagles lose a game, Monday can be a very emotional day in Philly. And this week, it seemed even worse than usual following Sunday's overtime loss to the Titans. That's due in large part to the way in which the Eagles lost, a microcosm for what's been plaguing the defending Super Bowl champions throughout the first month of the 2018 NFL season. The secondary was a liability. The offensive line struggled to protect their franchise quarterback. There were costly penalties at key times. Doug Pederson's play calling doesn't seem as sharp. And the list goes on. Yet, here we sit a quarter of the way through the season, and the Eagles are 2-2, a half game behind Washington for the NFC East lead, and are just one or two plays from being 3-1 or even 4-0. So why does it feel like the sky is falling in Philadelphia? Perhaps, as defensive coordinator Jim Schwartz pointed out on Tuesday, the Birds are also one or two plays away from sending this city into an all out panic. "You can look at our team and say we're one play — and maybe I can point to a dozen plays from the Titans game — we're one play away from being 3-1," Schwartz said. "We're also two plays from being 0-4. We need to face that. And we're sort of right in the middle of that being 2-2. But Julio Jones makes a catch or Andrew Luck escapes out of a sack and finds somebody in the end zone, and all of a sudden, we could be looking at a completely different thing." That seems to be a common notion surrounding the Eagles at the quarter pole: What are the Eagles? Are they the championship-caliber team we saw upset its way to Philly's first Lombardi Trophy? Are they merely a playoff team destined to play road games in January? Or are they something even worse? The good news is, it's still early and they were only one game better a year ago. Here's one last look at what they're saying about the Eagles before turning our full attention to this week's NFC Championship rematch against the Minnesota Vikings. What if the Eagles stink? Being a Philly guy, Dan nailed the mood in his city following the Eagles' loss. It was too spot on, that the Carson Wentz-Joe Flacco comparison has me wondering if Dan is actually @FakeWIPCaller. After months of nothing but good feelings about the Eagles, Philly fans have had to adjust to what (so far) have just been the same ol’ Eagles. Sure, they’re just 2-2. But, in the games they’ve won, the opposing team has had the ball down to the goal line with a chance to win in the final seconds. Sure, they’ve been injured. But they were injured last season and still won the Super Bowl. This year they’ve just looked bad. The concern over the Eagles wasn't specific to their fans. Over at The Ringer, Robert Mays is also trying to figure out this team's identity. And like Angelo Cataldi, he doesn't see much of a resemblance between this year's version and last year's championship squad. At least not yet. Not everyone, however, is losing faith in the defending champs. Bleeding Green's Brandon Gowton thinks it's still too early to panic, especially with a big game with huge playoff implications on the horizon. It’s entirely fair to be very frustrated with Sunday’s result. It’s entirely fair to point out that this team has some real issues. But I don’t think they’re doomed just yet. One of the reasons to remain positive — Mike Kaye of NJ.com offered up 11 of them — has nothing to do with the Eagles. But it's true nonetheless. The Redskins, Cowboys and Giants have all stumbled out of the gate. While the Redskins and Cowboys have each won two games, their wins haven't been all that impressive. If the Eagles are able to respond to their early adversity immediately, Philadelphia has very little to worry about in the hunt for the division title. As of right now, the Eagles only trail Washington and Dallas on formalities. The Redskins have yet to play a fourth game, so their sample size is smaller at this point. The Cowboys have the same record as the Eagles but Dallas played a division game sooner, defeating the Giants in Week 2. Is 2-2 the end of the world? Maybe not. The Eagles have made the playoffs the last six times they’ve opened a season 2-2, a streak that dates back to the 1980s. Three of the last four times they’ve been 2-2, they’ve even reached the NFC Championship Game. Apparently All-Pro running back Le'Veon Bell expects a call from the Eagles next offseason.